French wines can be a challenge to buy because as with many European wines, the label tells you what wine region they are from, but nothing about the grape varieties or blend (I plan on having a whole series of postings to talk more about "What's in a Wine Label)". 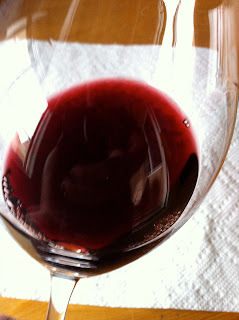 Bordeaux, Burgundy, Loire, and other French wine regions each specialize in certain types of grapes (white and red), but instead of bringing a wine encyclopedia with you to the wine shop, I recommend becoming familiar with some go-to types of French wine - and from there you can experiment and grow your list of French wines you enjoy. 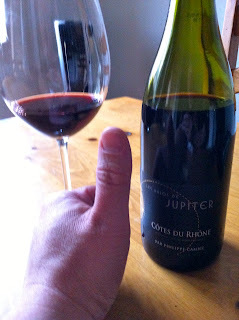 For me, I have found Cotes du Rhone to have some very good examples of everyday red wine just to enjoy, or to pair with a meal - so that's my pick for this week's tasting. 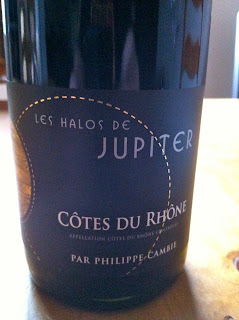 Cotes du Rhone wines come mostly from the southern Rhone region near to where other famous wines like Chateauneuf du Pape are make. These southern Rhone red wines are made from some combination of Grenache, Syrah, Cinsault, Carignane, Counoise and Mourvèdre grapes varieties, with Cotes du Rhone wines being mostly made from Grenache. This week's Halos de Jupiter Cotes du Rhone is a blend of Grenache from very old vines (85%), Syrah (10%) and Mourvèdre (5%). Appearance: Clear, dark red/purple core with a water white rim. Aroma: Fairly muted, with nice blackberry and baking spices with a little hint of something herbal - maybe toward rosemary or even just dried leaves. 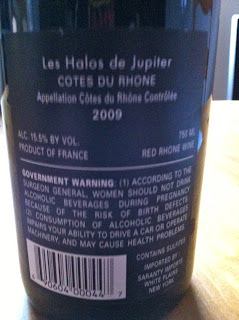 Very nice overall - with French wines you can tend to get a good combination of fruit and non-fruit aromas. Taste: Definitely a more fruit forward version for a French wine, but definitely has similarities to a Chateauneuf du Pape. 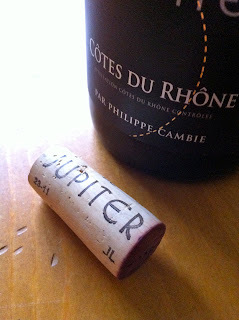 Seems like it will be overly acidic (mouthwatering feel), but it dissipates quickly to leave a nice balanced finish. More complex and interesting than other Cotes du Rhones I've tried. The Grade: I give this one an A. A very nice example of Cotes du Rhone - a little on the fruit forward side which I enjoyed, but still quite complex. This wine cries out for a good food pairing - beef, lamb, or even a roasted chicken. Fantastic wine for the price - I think I will give it a try the next time I make Thomas Keller's Roasted Chicken (if you haven't tried this simple yet exquisite recipe - you really need to - I usually pair it with an Oregon Pinot Noir). Wine Tip of the Week - There's an App for That! How About a Wine Tasting Party? Wine Tip of the Week - Just Enjoy It! Cooking with Wine - Taste Matters.